increased movement with less pain. Whilst some patients are concerned about their wounds in the hydrotherapy pool, a number of studies have allayed these concerns about wounds. It is imperative that you don’t consider a public pool as a venue for hydrotherapy post operatively. A purpose built physiotherapy run pool will screen all clients and ensure pool chemistry and hygiene is appropriate for wounds. Read more about wound management. Read more about hydrotherapy before and after a total hip or knee replacement. Traumatic fractures hips (fractured neck of femur) occur usually in older adults after a fall. There is often an associated wait for surgery, pain and loss of confidence and independence. Many who have had a fracture will then move less and get weaker in an effort to avoid future falls. This creates a cycle that leads to decreased strength, reduced balance and response times and increased frailty and loss of independence. Hydrotherapy exercise is often recommended. The water is often the place where these clients will move more and incorporate more strength, endurance speed and challenge to their movement as their fear of falling is reduced when in the pool. This is not only good for the body but the mind and soul! Water can be the ideal place to begin rehabilitation, especially if the patient is non-weight bearing on one or both legs. With varying water depth we can progress weight bearing gradually from 0% to 10%, then 20-30% up to 100 % with much more accuracy than on land. 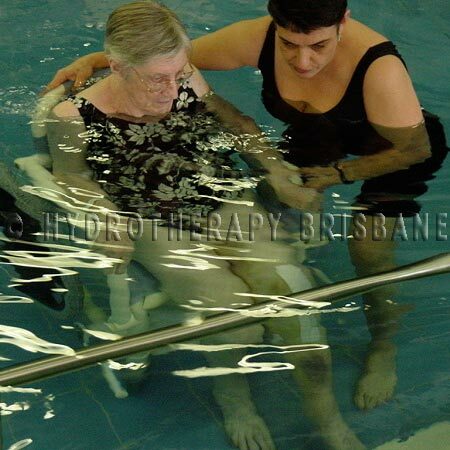 Hydrotherapy can be included in fast track rehabilitation programs for multi-trauma. Osteoporosis is another condition that we see in the pool both pre and post fracture. Balance and strength are important at any stage with osteoporosis but once a person has a fracture (or multiple fractures) it is less clear what our strength exercise programs should include. The water offers a safe environment where we are able to promote balance and falls prevention while aiming at a safe progressive strength component as well. Managing pain, posture, fitness and well-being are essential but all must be done with great care. Read more about use of aquatic therapy in treatment of osteoporosis. Please contact us to find out if hydrotherapy may be useful in your situation.